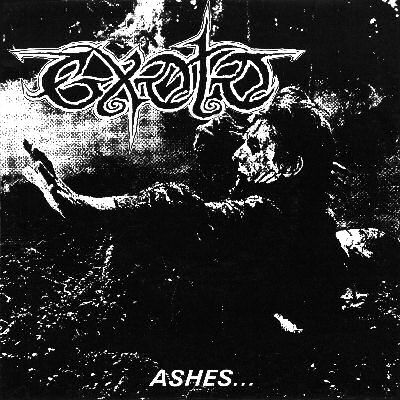 Exoto was a Belgian death/thrash metal band formed in 1989. Their sound was characterized by highly infectious classic death/thrash riffing and a vocal style reminiscent of the grindcore/death metal band Carcass. Lyrics in the main dealt with death and societal issues. Their first demo, "Waiting For The Maggots", a live recording, was released in the year of the band's inception. Subsequent demos "And Then You Die" and "The Fifth Season" received high critical acclaim, both garnering high marks in the Dutch magazine "Aardschok". Wim Baelus, a writer for the magazine, took two of the songs and released a 7" on his label Midian Creations called "Ashes". In the live arena, the band supported such luminaries as Morbid Angel, Dead Head, Grave and Annihilator. 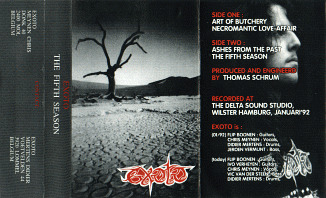 In 1993 the band issued a new tape called "Final Discorporation", which featured live songs and the "And Then You Die" material. The band subsequently signed to the Belgian label Tessa Records and released their debut full-length, "Carnival Of Souls". Shortly after recording the band lost drummer Didier Mertens in a car accident. The tape "Tribute To Didier" is released in his honour. The band's second album, "A Thousand Dreams Ago", was licensed from Tessa Records by Black mark and released on both sides of the Atlantic. The band was widely recognized as one of the Belgian/Dutch frontrunners of death metal but sadly split up some time after the release of their second full-length.